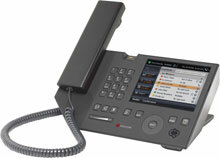 The Polycom CX700 IP Phone has been discontinued. No direct replacement is available. The Polycom CX700 IP Phone delivers remarkable high definition audio quality that provides the ultimate voice communications experience. With its sleek, high-quality handset and its full duplex, hands-free speakerphone, the CX700 IP Phone enables crystal-clear, natural conversations without echoes or feedback. Featuring a fully embedded Microsoft Lync Phone Edition client, the Polycom CX700 IP Phone provides direct, on-device access to the features and capabilities of Lync, all using a bright, touch-screen color display. It also delivers enhanced presence status information and voicemail indication, and enables users to easily control their calls, including click-to-call, conferencing, transferring, holding, forwarding, and ending calls.